If the pace of news coverage changes in a moment, the places where people actually get their news these days seems to be changing just as quickly. According to Pew Research Center’s biennial media attitudes survey, younger audiences are getting their news from completely different sources — and accessing it in a completely different way from their parents’ generation. Conducted last summer, the report cites the internet as now being the main source of news for nearly three in four Americans between the ages of 18 and 29, over more traditional media sources such as newspapers, television and radio. College students in particular have specific information needs although, like most young people, still want to keep up on what’s trending with everything from fashion to finance. Increasingly, the source they’re turning to is a very different take on internet news channels; The College Juice, a blog created for students, by students. This summer, The College Juice is augmenting its regular contributions from college students with the efforts of five interns who will be providing their voices and experiences to the blog’s postings. “We know the kinds of issues our students are interested in learning about,” explains Chloe Leach, a rising senior at Penn State, who has returned to Barnes & Noble College for her third internship. “It’s really important to have information that helps with the transition to college, and provides the information students need to navigate their way around campus and their college lives. The advice is even more relevant because it comes from students at the very schools Barnes & Noble College serves,” she adds. Adding to the relevance of the blog, The College Juice also has an integral social component designed to appeal to student interests and concerns. A recent promotion with Divine Chocolates, for example, helped support a ‘Bamboo Bike’ initiative, a program dedicated to raising funds for bicycles to enable students in Africa to attend school. But there is another major difference between how younger and older Americans consume the news that is even more telling. Approximately eight in ten Americans (79 percent) ages 18-29 said they only “graze” the news, drawn in by short-form, visually arresting articles. It’s a characteristic Webb acknowledges with the understanding she doesn’t have long to hold the reader’s interest. For that reason, postings on the The Juice are deliberately visually eye-catching and editorially relevant. “We invest in a design that’s really easy to read and to follow,” she says. And bearing in mind that ‘content is key,’ her team is charged with developing story ideas laden with tips and advice. The world of internet blogging has grown up in recent years, with early ventures of the form now maturing into well-read and highly contemporary news sources like BuzzFeed, Huffington Post and others. As The College Juice builds on its core of dedicated student followers, the team is dedicated to bringing the campus blog to a still wider audience, with secondary postings throughout social media. 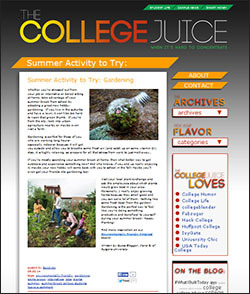 “We post a lot of articles to our Facebook and Twitter accounts,” Webb explains, “and we’re also building a lot of success through Pinterest, as our visuals deliver a lot of traffic back to The Juice.” Not content to rest on their success, Webb, Leach and the team are continuing to develop The College Juice in keeping with the changing needs of students.